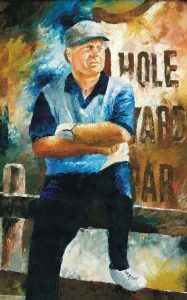 A Jack Nicklaus drawing with palette knives. In a delay in play on the 18th tee on Pebble Beach golf course, in this drawing of Jack Nicklaus sits on the famous fence waiting to tee off. Therefore, a golf art collector, ordered this famous moment in golf history.